It’s time to bring back the Close-ups. I started the series 2 years ago, when I fell off a ladder and broke my wrist. Using one hand, I wrote about and showed pictures of past projects, organized by theme. It helped me get through the 4 month recovery period, when I couldn’t sew. See the whole Close-ups series here. Right now, I’m in hibernation, making parts that will be used in an animation my husband Rob and I are doing. This “little” project is growing into more than a winter activity, though, and it will be a long while before we’re finished. I want to wait until we have a finished film (probably a few minutes long) before we show anything, including process photos. I’ve got other art related commitments to take care of this year, so I’ll soon have to put the animation project aside until I have more time to get totally immersed. Back to sheep–which are giving birth at this time of year. Maybe it’s their expressions, or their ears, or their white fluffy body balls with stick legs, but sheep are very satisfying to portray. 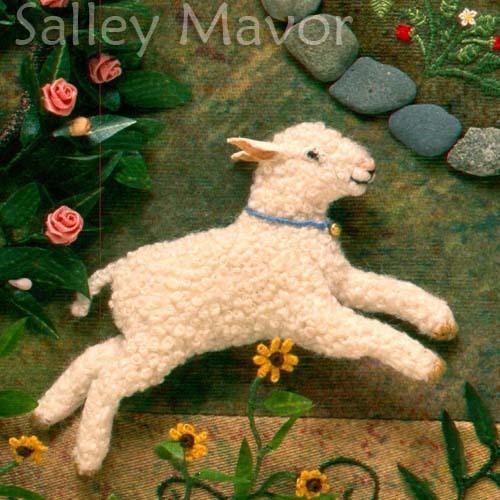 This first image at the top of the post is a detail from my picture book Mary Had a Little Lamb. See more pictures from the book here. The one below is part of an embroidered piece I made in art school in 1974. 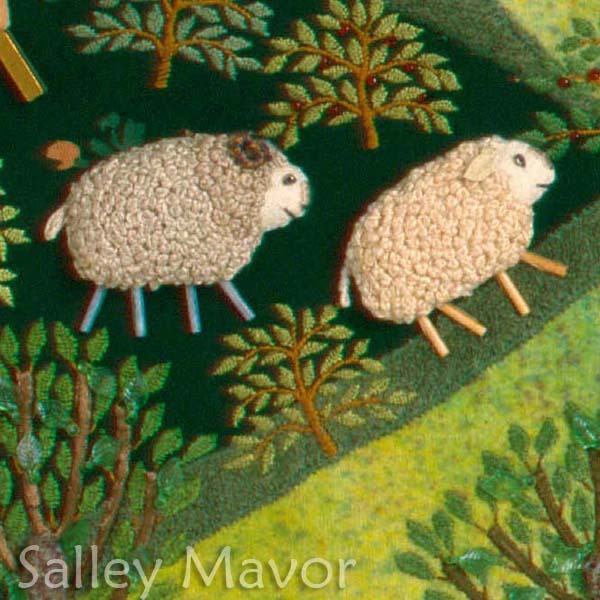 These sheep from my 1986 Noah’s Ark fabric relief, show the beginning of my love affair with French knots. 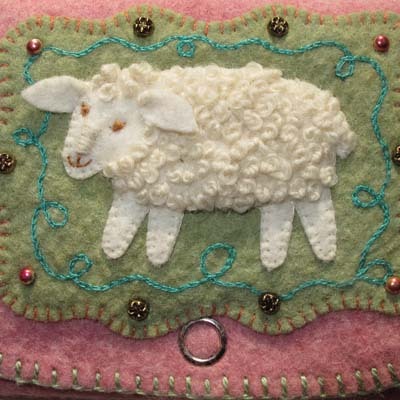 Here’s a simpler, appliqued version, which decorates a felt purse in my 2003 how-to book, Felt Wee Folk. Then, there are several details from nursery rhymes in my 2010 picture book, Pocketful of Posies. 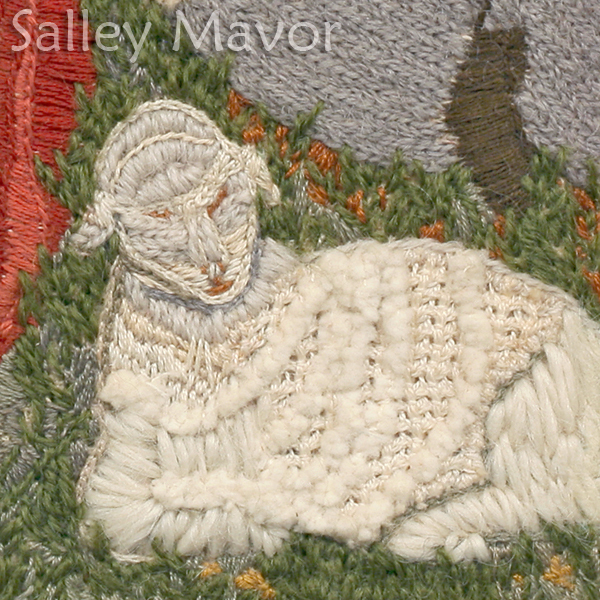 This entry was posted in Animals, Closeups, Embroidery, Fabric Relief by Salley Mavor. Bookmark the permalink. I recently bought Pocketful of Posies for my little grandson’s third birthday….I hope he loves looking at all the details as much as I did! All of these images say “Happy spring”! Lovely work! Wonderful. Thanks for sharing these and the links to others. 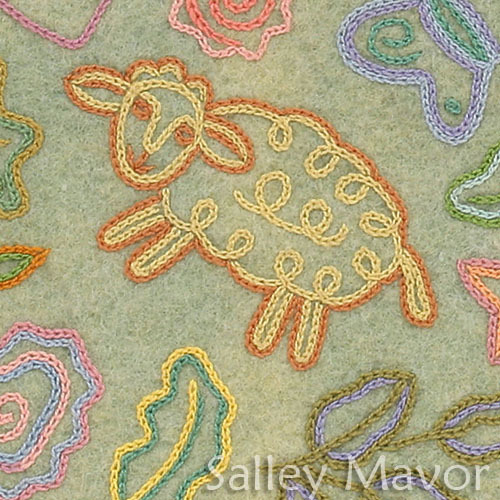 these little sheep are divine! 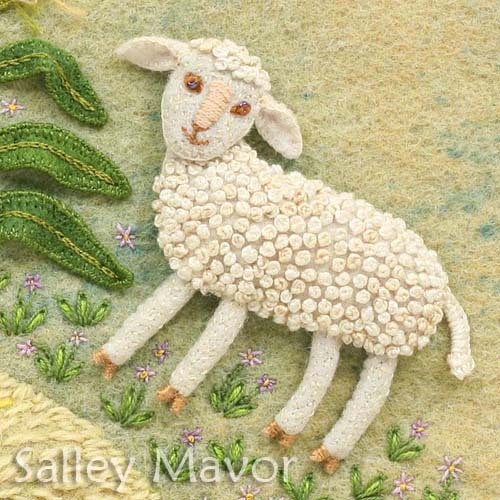 nothing screams spring like sheep and rabbits. wow, and you do them so well. thanks for sharing such precious little images. Just love ALL the sheep and lambs. Also your colors are SEW charming, great contrast in the last picture. Such a beautiful brown in the sheep against the orange wool. Do you dye most of the wool? Thanks, Sue. 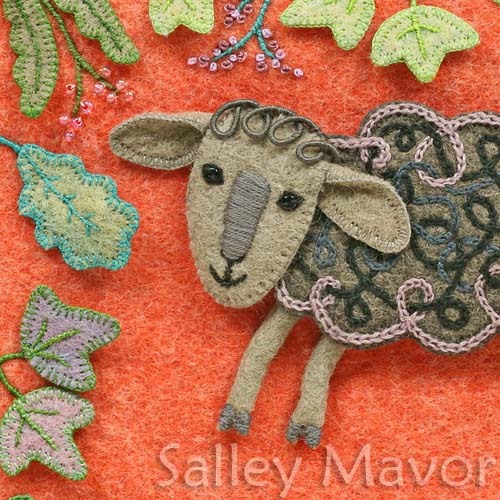 I buy naturally dyed wool felt, which you can find out about on my FAQ page. Its a shear 😉 delight to view your work. My favourite is the first one in your post. I am just in total awe over your work. I love to do hand embroidery, but yours is in another dimension. I work from vintage patterns. Also, I love applique and have been trying to figure a way to do The Old Lady Who Swallowed a Fly, my favorite that I have always read to my grandchildren. Have been trying sketches for a year, but have not found the courage to do it. If I had your talent, I would be in heaven. Maybe you might try your hand at this wonderful rhyme. Lovely. Shared with some friends! Thanks Sally. Love the sheep! You do beautiful work! What dear little sheep, they all make me happy. Your work is just delightful always. Thank you Salley. Thank you for sharing this wonderful herd of adorable sheep. I have loved lambs and sheep forever and appreciate all of your various methods of creating them…just precious! Horray for Sheep! Thank you for sharing the lovely close-ups. 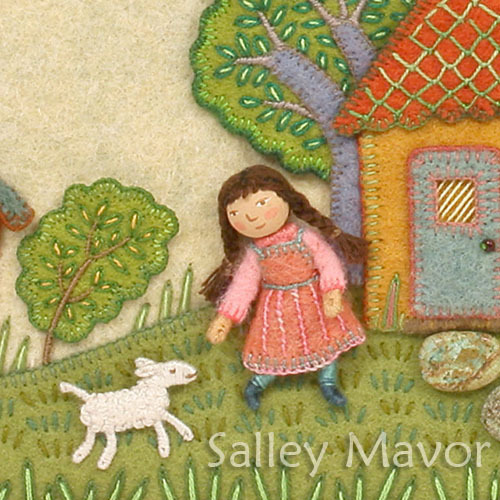 Thank you Salley for sharing that book of The Old Lady Who Swallowed A Fly. I have looked at that particular one for inspiration in the past. I have one personally that I love and my grandchildren loved it also, so I’m using both for some inspiration. adorable! I collect sheep because I’m a handweaver. I also have all your books! 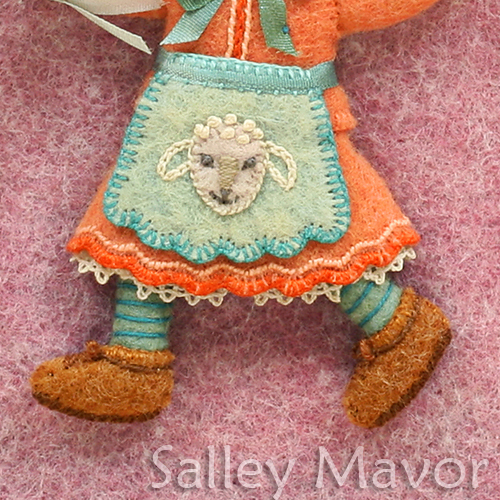 I love baby lambs, particularly your artfully whimsical ones! I so admire the patience you exude in the minute details of each creature.